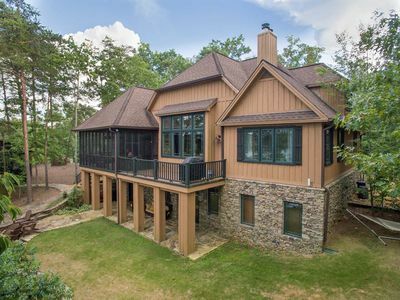 Equisite in detail and charm offering Comb-Cedar & Stone craftsmanship, tongue and groove cedar ceiling, built in 2009 describes this quaint nostalgic lake cottage offering magnificent views of Lewis Smith Lake from all angles. 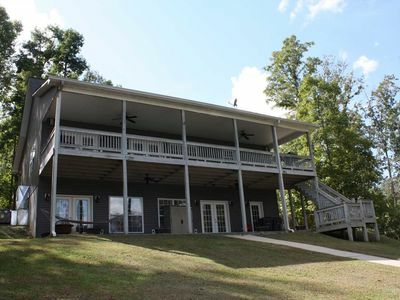 Total privacy- nestled in a secluded “off the beaten path” area of Lewis Smith Lake across from the beautiful Bankhead National Forest. 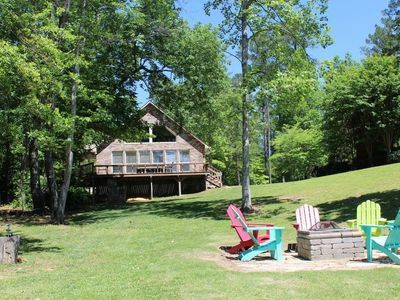 Our "piece of heaven" is ideal if you are looking for total seclusion in getting away from it all! Our water depth at dock is 65' deep and crystal clear water. We are just 10 minutes by boat to Duncan Bridge Marina. 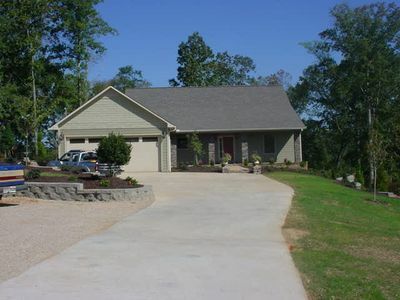 30 minutes by car to Double Springs, AL, 45 minutes from Jasper, AL., 1 hour 1/2 from Huntsville, AL. 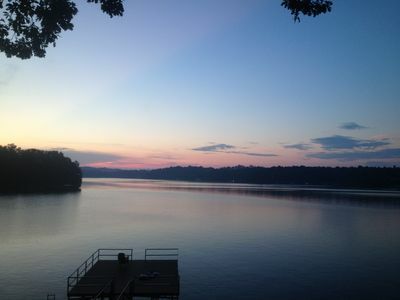 Experience an awakening of our eastern sunrise views from our Master Suite area (breath taking sunrises !) bring your camera. 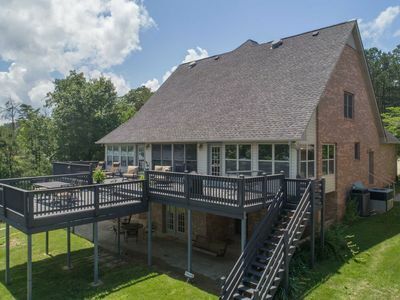 If you are a nature lover & outdoor enthusiasts-you are in for a treat- walk / hike less than 75 yards and find yourself covered in nature and tranquility as you meander throughout the Bank Head National Forest 3 minutes away. Some of the wildlife you may encounter include: White Bald Eagles occasionally, Deer, Turkey, and Waterfowl Geese in abundance. 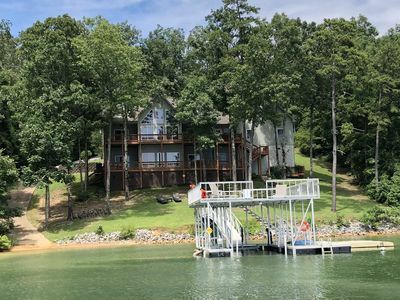 Sit back, relax, and enjoy yourselves as we open up our lake cottage to you our guest and feel what being "Star Struck" is all about. Witness the peace and serenity as you step back in time leaving the grind and the stress of big city life in your rear view mirror. 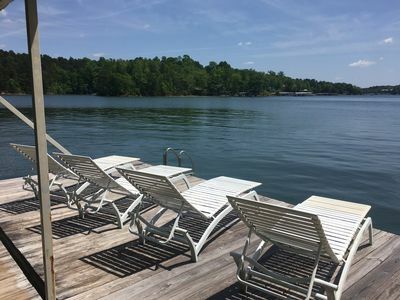 Discover the Alabama night skyline- witness as you discover "The Stars Do Fall on Alabama"
Grill out and enjoy the outdoor entertainment gazebo as it offers views of the south’s 3rd cleanest lake in the country right in our own backyard. 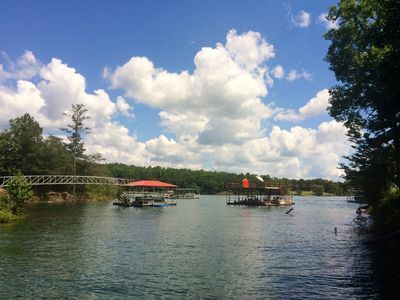 You will experience the deep emerald green water unlike no others of which this lake is known for. 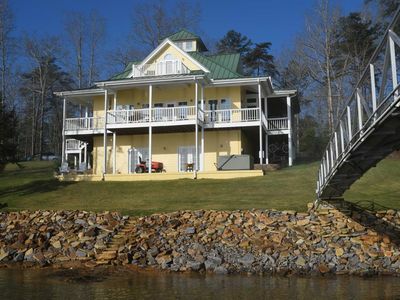 Gentle slope w/stair step walkway to our single slip boat house - no HIGH BLUFFS to climb or stairs at StarStruck !! 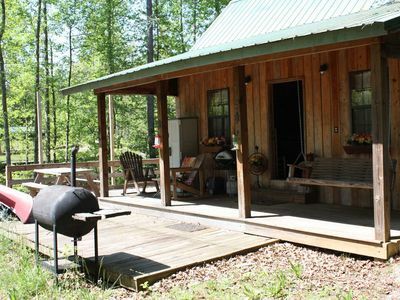 We welcome all season travelers & fish enthusiasts. 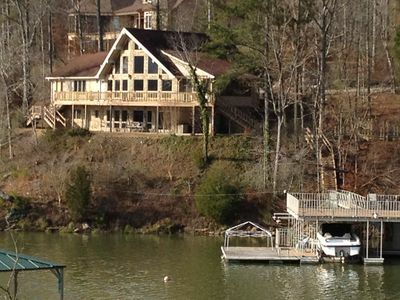 Lake is host of 3 world fishing titles,and a favorable host of Bass Master Pro circuit. We catch fish regularly both stripped bass & spotted bass right off our dock. I will be more than happy to share with you my secrets of success in landing your “fresh catch” of the day. Clean your own 'catch' outside at owners fish cleaning station as provided with a full sink with running water. 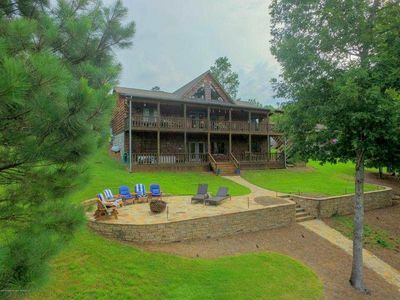 Amenities include: Tastefully decorated on a lake theme decor with tongue and groove cedar ceiling in Great Room. Gaze at the magnificent 22' standing rock fireplace in Great Room offering warm & soft ambience on those cool & chilly nights. 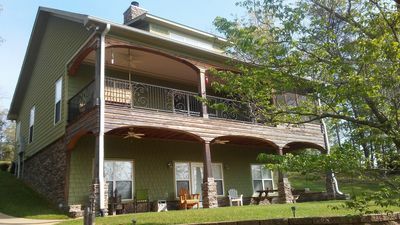 Ceiling fans throughout, Central Heat & Air, stackable washer & dryer on main floor, fully equipped kitchen state of the art stainless steel appliances & solid surface granite countertops, kuerig coffee maker, double sided stainless steel kitchen sinks, and dishwasher. 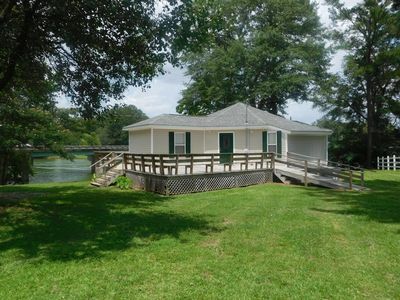 Half bath off main foyer, open great room off kitchen with awesome lake views. 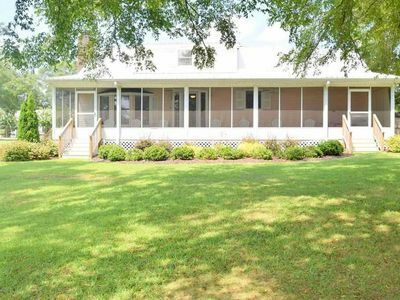 Main master suite w/tile master shower, all hardwoods and tile floors throughout, 12 x 12 screen in covered porch off kitchen offering lakeside views, full covered exterior porch on main level for entertaining/reading pleasure with hanging day bed. 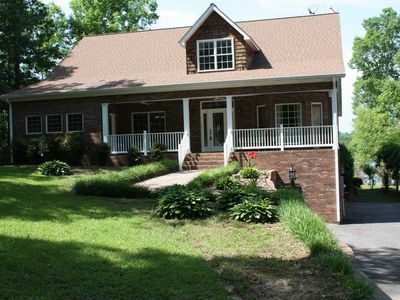 full finished basement downstairs, stained concrete tile floor, kitchenette w/sink , bar w/ stools. (2) TV's (local channels) available in master suite & daylight basement LR, Dvd player’s available in master suite, basement LR. Cell phone coverage good with most carriers AT&T, Verizon, T-Mobile. No Internet/Wifi at this time. Full Bed in Alcove Daylight Basement. Daylight Basement – Bed 2 – Queen . Daylight Basement- Bed 3 – King. 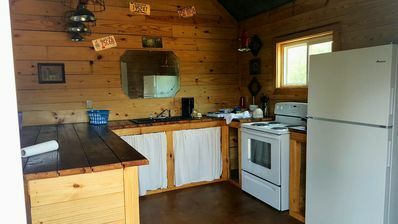 All bedrooms in daylight basement share same full bath & master shower. AMAZING VIEWS! Unique decor! 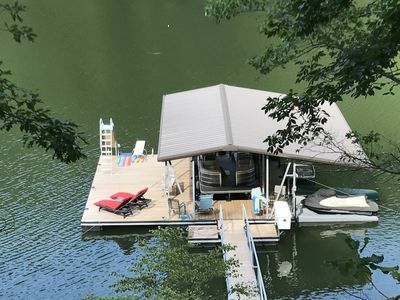 Best swim deck around with slide and water toys. 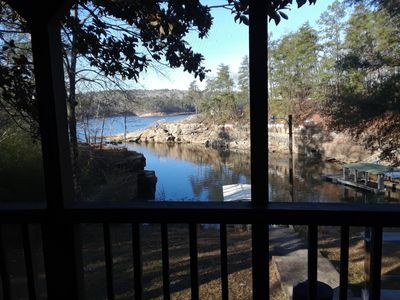 Brushy Creek Getaway.....Deep water, Great views! 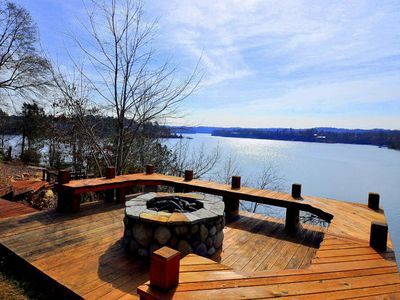 Smith Lake Rentals & Sales - BIG BEND - Covered Decks for enjoying the view!